UNICEF Goodwill Ambassador and Emmy-nominated actress Millie Bobby Brown helped pack supplies for some of the world’s most vulnerable children during a visit to UNICEF’s global supply headquarters in Copenhagen this week. 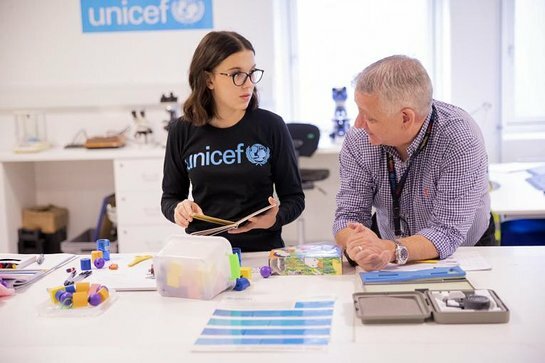 UNICEF Goodwill Ambassador Millie Bobby Brown at UNICEF's global supply hub in Copenhagen, Denmark. Brown helped assemble Early Childhood Development kits, which offer children living in conflict and disaster areas access to play and learning. Each kit is designed to help caregivers create a safe learning environment for up to 50 children who have experienced trauma and stress, and includes art supplies, puzzles and games, and board books and puppets for storytelling. Brown toured UNICEF’s supply and kit-packing operation in Copenhagen – the world’s largest humanitarian warehouse – which leads the supply planning and distribution of emergency, health, nutrition and education supplies to children and families caught in, or displaced by conflict, natural disasters and other crises around the world. In 2017, UNICEF procured $3.46 billion worth of supplies and services in 150 countries and areas. Brown was appointed UNICEF’s youngest ever Goodwill Ambassador in November 2018. On this visit to UNICEF’s global supply headquarters, she was accompanied by representatives from Italian apparel manufacturer and lifestyle brand, Moncler, as part of Moncler’s family #monclerfriends. In 2017, Moncler and UNICEF launched the “Warmly Moncler” for UNICEF project to provide winter kits for vulnerable children and families to keep them warm. The kits include items such as thermal blankets, hats, gloves, scarves, shoes and socks, fuel to heat homes and schools, and spaces where children can play. Between 2017 and 2018 more than 38,000 children and families, mainly living in Nepal and Mongolia – some of the coldest countries in the world where climatic and social conditions are the most challenging – benefited from this partnership.